Link to antibody purification kit. If there is anything else I can help you with, just let me know. I would like to follow up on the replacement antibody discussed below. Can we request a replacement? Looking through our records, it seems we already issued a credit to compensate for the ab30394 that wasn't working, as requested by email in May. The credit note number is ***, and it was probably applied back to the credit card used on the order. Could you confirm with your purchasing department whether this credit was received? They can contact our accounting department at mailto:us.credits@abcam.com or 888-772-2226 if they have any questions. This credit can be applied to the invoice of a new order placed with us, so it will essentially be a replacement antibody of your choice. I am very sorry for any confusion regarding this credit note, but please let me know if you have any questions or concerns, and I'll be happy to help you further. 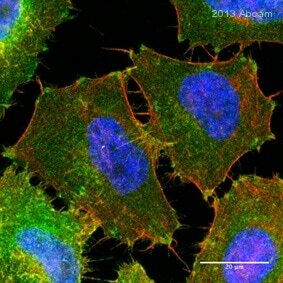 I know that this antibody is specific for integrin beta 1. I want to know if it will bind to only to activated integrin beta 1 or it will bind to all integrin beta 1 (activated or not). My apologies! The antibody will recognize all integrin beta 1 and is not specific for activated integrin beta 1. Thank you for contacting Abcam regarding ab24693. This antibody is specific for integrin beta 1 and is not expected to react with all integrin proteins. Thank you for kindly confirming these details. I am sorry this vial of antibody has not worked for this customer. As requested, we are pleased to arrange a free of charge replacement. I can confirm that 1 vial of alternative replacement ab52971 has been added to your order number ######. This has Abcam order reference #####. I would like to reassure you that this free of charge replacement vial is also covered by our Abpromise guarantee. Should the customer still be experiencing difficulties with the new vial, or if you have any further questions, please do not hesitate to let me know. Also, please note that this item was purchased 8 months ago, outside our guarantee period of 6 months. Therefore this free of charge replacement is being provided as an exception in this case. We would encourage all customers to please contact us as soon as possible if they encounter any difficulties, and within 6 months of purchase to be covered by the guarantee. Thank you for your help and cooperation with this case. Please do not hesitate to contact me if you need anything further. This product was originally purchased by the customer for use on mouse tissue via Western blot. Western blots experiments were carried out on mouse tissue between January-May 2012, but there were issues with the results (see the attached Technical Enquiry Form). The customer would like to know why the ‘mouse’ species reactivity was recently removed from this product datasheet and whether this could be the reason her experiments are not working? Purchased a new secondary ab. This antibody used to be sourced externally, and had been successfully tested in mouse. After the customer purchased this product, from November last year,we now producethe same clone in house from the same hybridoma,but it has not yet been tested by us in mouse samples so mouse was removed. So when the customer purchased the antibody, it was guaranteed in mouse. My colleagues are currently checking the data from a publication in which the same clone has been used in mouse to see whether we can add this speciesagain. I appreciate the time you have spent in the laboratory and understand your concerns. It is regrettable the results have not been successful. Reviewing the details, I am sorry there are no further tips to provide on this occasion to help improve the results. I can suggest you have regrettably received a bad vial. However, please note that we would encourage customers to contact us as soon as possible if they encounter any difficulties and to contact us within 6 months. 1. I suggest to try blocking for 1 hour at room temperature. Overnight may be too long. 2. Was the sample heated to 95oC for 5 minutes in sample buffer containing SDS and mercaptoethanol to reduce and denature? This will help to ensure the protein is in the correct conformation to run at the correct molecular weight. can you issue an abcam credit to the account for the amount so we can order what we need off it when we need stuff? We need 1 antibody now that’s a secondary – but if you issue a full credit, I am fearful the funds won’t go back towards getting antibodies ;). If this is possible, let me know. Or If you can order the replacement for us, and then put the additional as a credit on our abcam account – that would be great. Thank you for your reply, and I'm sorry we couldn't get this antibody working for you. I've gone ahead and issued the full credit for your original purchase, and since this was paid by credit card it will actually be refunded back to your card pending approval of our accounting department. You can contact our accounting department at mailto:us.credits@abcam.com if you have any questions about the credit, and please referenced credit note # ***. Please let me know if you need anything else from me, and I'll be happy to help! Have a great day. thank you for being patient with us in trying to get an antibody working. I was wondering what the process was like to get a replacement product for the cost of the B1 antibody, but not the same product? Thank you for your email. I apologize again for all of the trouble with this antibody. I'd be happy to send any antibody you'd like as a replacement. If there is a cost discrepancy, I can issue a credit for your original puchase, and you can order the replacement item separately, which will even out the prices. Which product would you like as a replacement, and I will see which option would be best? Please let me know if you have any further questions. I look forward to hearing from you. No bands in WB with new vial of this antibody. Previously worked perfectly. We discussed yesterday the possiblity of sending ab24693 as a replacement depending on the QC Western blot data for the lots that are in stock. I've heard back from the lab, and this antibody is only batch-tested in ICC/IF, not in Western blot. Would you still be willing to accept this as a replacement, or would you prefer a credit or refund at this point? I'm happy to send a vial of ab24693 regardless, and if the results are not satisfactory then I can issue a credit or refund. I can send out a replacement tonight and it would arrive tomorrow. I apologize again for the batch variability of ab30394, and I am hoping that ab24693 would work better for you. Please let me know what you would prefer to do.